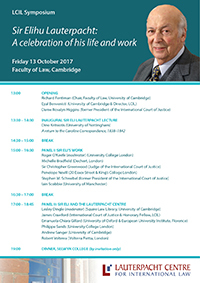 On 13 October 2017, the Lauterpacht Centre held a symposium to celebrate the life and work of Sir Elihu Lauterpacht CBE QC LLD, Honorary Professor Emeritus of International Law at the University of Cambridge, Fellow of Trinity College, and founder and Honorary Fellow of the Lauterpacht Centre for International Law, who died on 8 February 2017. The symposium brought together Sir Eli's former colleagues, students and friends to remember his influence on the law and their lives, and Fellows from the Lauterpacht Centre to discuss how his vision for a thriving research centre for international law in Cambridge is still very much alive. Sir Eli Lauterpacht: A Great Mentor: Dr Andrew Sanger, Volterra Fietta Junior Research Lecturer and Affiliated Lecturer, University of Cambridge.